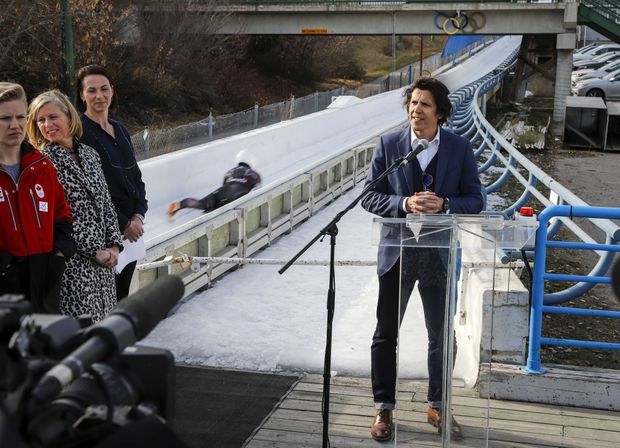 International Olympic Committee official Christophe Dubi speaks as a skeleton athlete passes by on the track in the background at Canada Olympic Park in Calgary last week. Ottawa, Alberta and Calgary were engaged in last-minute negotiations late on Tuesday over funding for the city’s bid for the 2026 Winter Games as council prepared to vote on ending its Olympic pursuit and cancelling a Nov. 13 plebiscite. With a city council vote scheduled for Wednesday on whether to pull the plug, a number of Calgary’s councillors said they were waiting to see whether an agreement can be reached overnight with the provincial and federal governments to secure the $3-billion needed in public funding to hold the Olympics. To cancel the bid, 10 members of council, or two-thirds, would need to support the motion. Five members have either previously indicated they oppose the bid or said they would vote to cancel the entire process if a funding agreement wasn’t in place by Wednesday morning. Two others declined to say and four could not be reached. Four have said they were considering voting to continue with the bid and plebiscite. Evan Woolley, the chair of Calgary’s Olympic committee, tabled a motion on Tuesday to walk away from the bid amid a deepening dispute with the provincial and federal governments over who would pay for the Games. Last Friday, Ottawa announced it would cover half the cost of the Olympics, millions short of what council was hoping for. The Calgary 2026 bid corporation has estimated the cost of the Games at $5.2-billion, with $3-billion coming from all three levels of government. Ottawa has put forward $1.5-billion and Alberta has offered $700-million. Despite a weekend of intensive talks, Mr. Woolley said no progress was made on closing the $800-million gap. He told The Globe and Mail that along with the existing federal contribution, the city was looking for Ottawa to cover the full security costs of the Games as well as possible cost overruns. “Without that, there is no deal,” he said. Councillors said the last-minute scramble has left them frustrated with Ottawa and the provincial government. The first mail-in ballots have already been cast in the plebiscite, despite no final numbers on funding. Councillors Jeffrey Davison and George Chahal said the plebiscite should proceed if a funding deal is reached. Scott Hutcheson, the chair of the Calgary 2026 board, said in the statement that he was confident an agreement will be reached. Alberta’s Minister of Culture and Tourism, Ricardo Miranda, did not make himself available for an interview. His press secretary said in an e-mail that the province is waiting for the results of the council vote, but has no plans to change or increase its funding commitment. Kirsty Duncan, the federal Minister of Science and Sport, wasn’t immediately available to comment on the decision to put the motion before city council. Earlier on Tuesday, Ms. Duncan said she was optimistic about negotiations, but she said the federal government would respect the existing policy on funding up to half for sports events.